Estate sale lovers, we aim to please here at AO Estate Sales this upcoming estate sale in Shoal Creek will NOT disappoint! This house is packed full of wonderful collectibles, practical items, trinkets, vintage clothing, handcrafted items. Read on, and you’ll find out. This estate is a dream! Walking through this house is like stepping back in time as you forage through years and years of living. Purchased in 1975. From a generation of Aggies, our estate owner was a life-long Austinite, raising his family in Austin and spending his retirement years here with his wife, who was an artist. 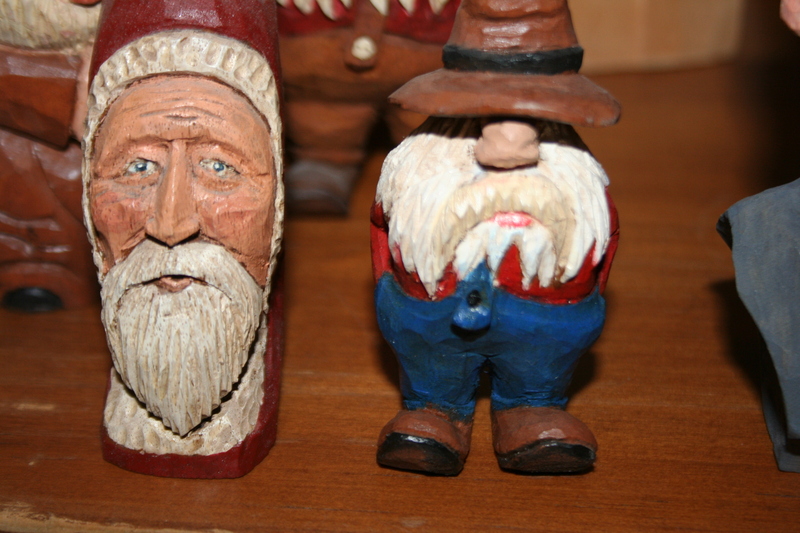 Fred Hartman worked for the state and in his golden years took up woodcarving as a hobby. 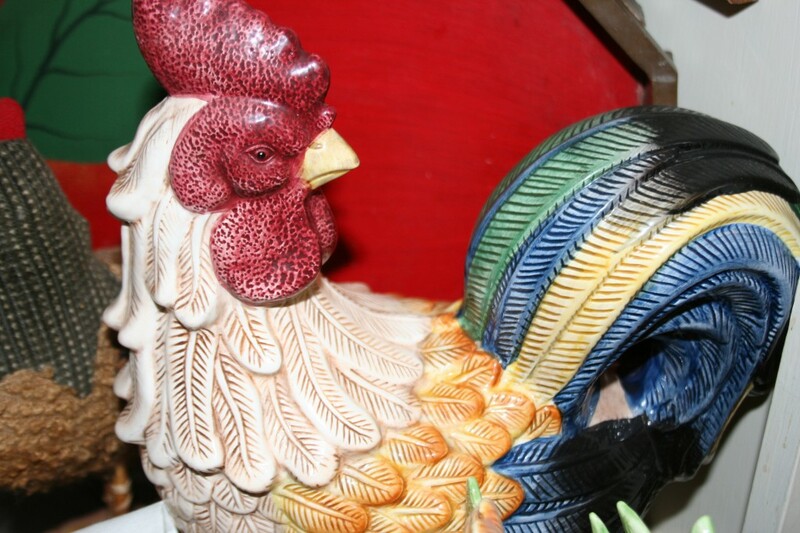 He and his wife worked together to carve and paint handcrafted curios, which they gave out as gifts to friends and family. But luckily, we still have many of them to sell and make available to you at our upcoming estate sale. 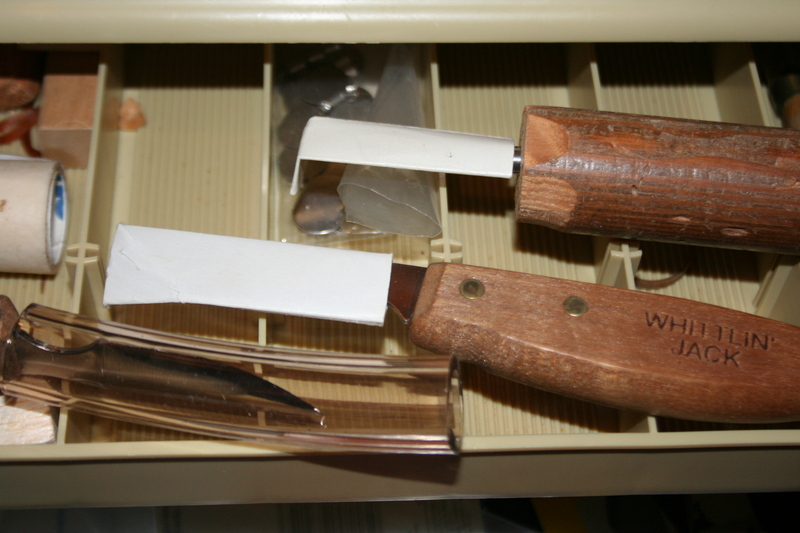 Fred’s daughter, Linda, said that her father (like a true Texan) was always “comfortable with a knife in hand.” He loved knives and had an extensive collection of varying types including pocket knives. Working with hands on these hand carved items was just a natural extension of his personality, she said. Fred and his wife worked on these curios together. He carved them from patterns and she painted them. 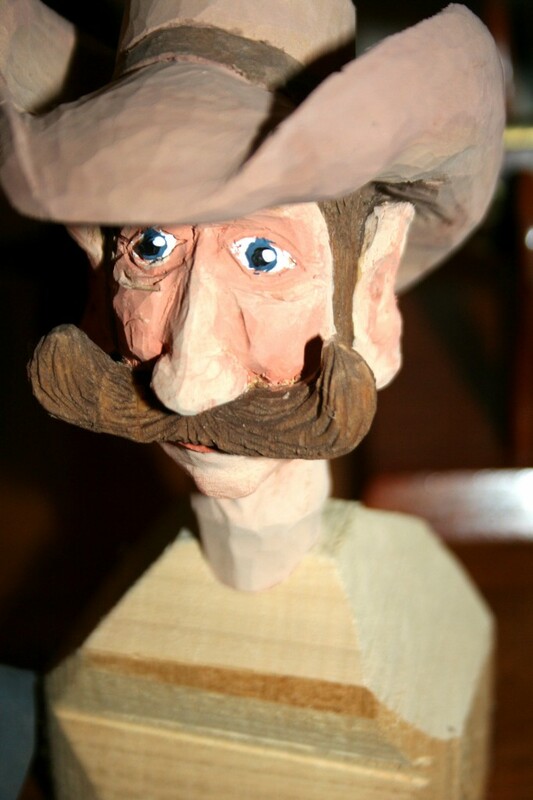 Linda said that her dad loved cowboys, but many of his carvings were made from her mother’s picks. She loved birds and together they also made many hummingbird carvings as well. Along with the wood carvings, we also have for sale the original wood carving supplies with all the knives and tools needed for this activity! Linda’s mother’s bird collection extended throughout the home, much of her bird collection was in these great vintage ceramic birds often seen in kitchens. We are still unearthing items and taking photos. This is just the tip of the iceberg! We’ve got more really cool photos to come. 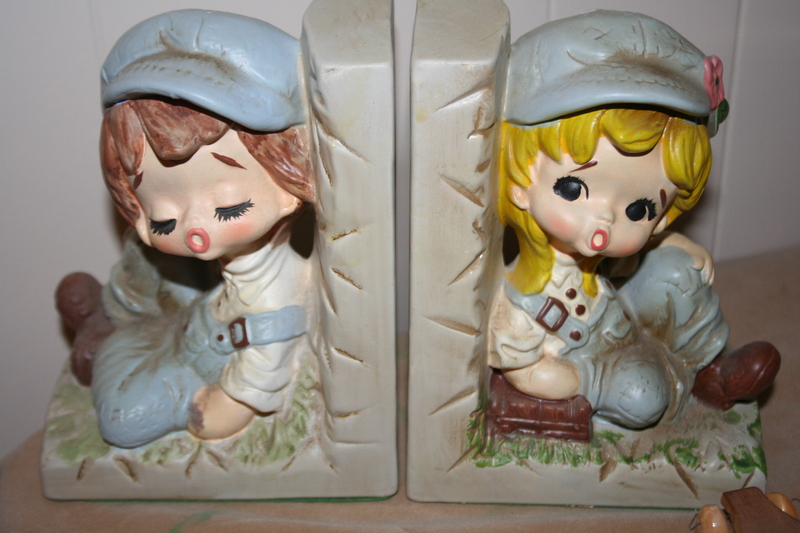 Like this sweet vintage set of book ends. 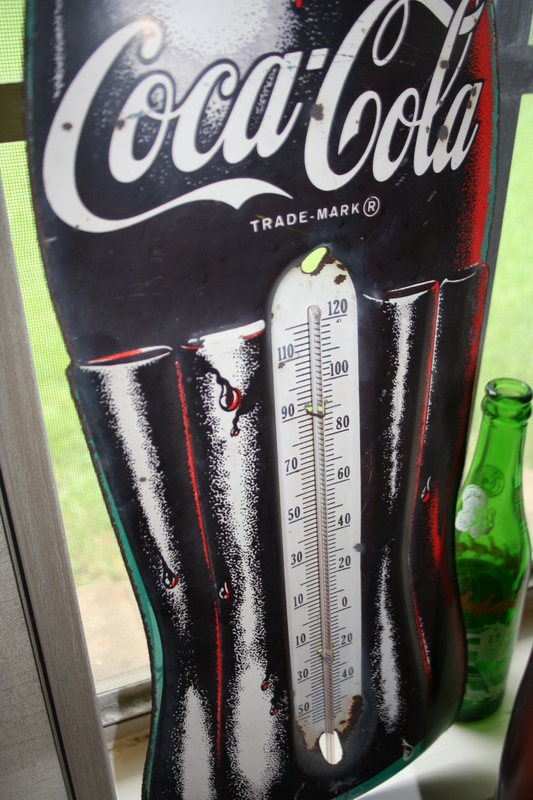 We’ve also got vintage Christmas ornaments; Texas inspired cookbooks, Holly Hobbie, Dr. Seuss and other classic children’s books; ceramics; many books including Texana, artwork; a cool Coca Cola temperature gauge; original artwork, and antique art and photos, tons and tons of classic & vintage jewelry; collectible Star Wars and Charlie’s Angels bubble gum trading cards (the ones with the puzzles on the back); 1970s kitschy artwork; vintage bolo ties and carved ones too; decorative crosses; Aggieland yearbooks; antique golf clubs; German travel and souvenir books; German steins; even a pair of authentic, vintage Lederhosen; ladies vintage clothing; old school jackets; western wear; cowboy boots, hats, leather belts; and lastly we’ve got a full cook’s kitchen. Now onto the GARAGE. Let’s just say it is also FULL! Including lawn mowers; patio furnitture, and garden items, pocket knives; fishing rods and reels, gun reloading supplies; wood carver’s tools; and much more we are still unearthing. PHEW! Be sure to watch for us on Facebook, Twitter, Instagram and Pinterest (follow the Upcoming Sale: Stuff You Can Buy board for newly posted estate sale items). We’ll be posting more photos over the next week. The address will be announced next Thursday. This estate sale is happening June 6, 7, and 8. If you’d like to get an email announcing all the details of the sale, be sure to sign up here for my newsletter, which is NEVER spammy! One Response to Another Epic Amber Ostrich Estate Sale: Something for Everyone in Shoal Creek!